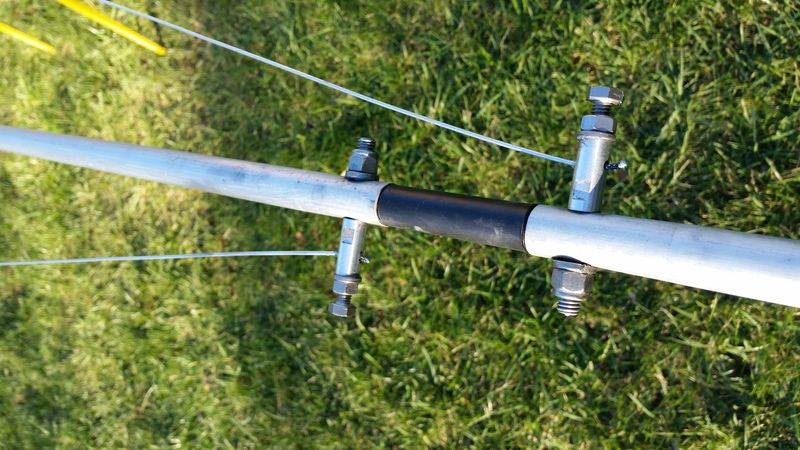 This page is a collection of thoughts and pictures while rebuilding the Force 12 C-4SXL four-band Yagi, original design with linear loading. 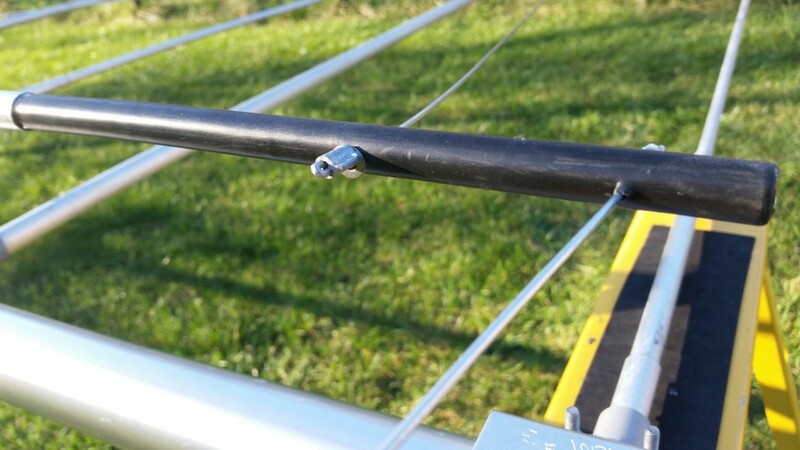 If you own an old Force 12 antenna and have contacted the new Force 12 about upgrades and parts, you know how helpful they are, and if you are a US ham having a US source for support and parts is invaluable and Force 12’s designs and quality are excellent.. They are a great company, and I’d love to own one of their new antennas. Of course I have this old one and I couldn’t resist the challenge of rebuilding it! 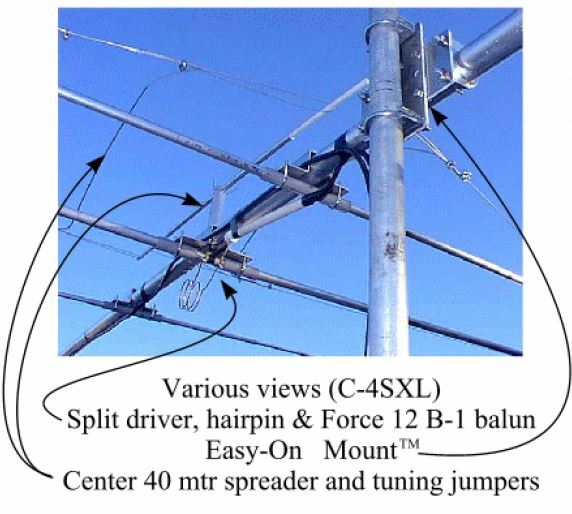 It seems every ham has their own ideas about how to build and rebuild antennas, and I’m no exception. I welcome any comments from others who have rebuilt their own old aluminum skyhooks, especially these old Force 12 models. All pictures on this page will launch full-resolution versions in a separate window when clicked on. 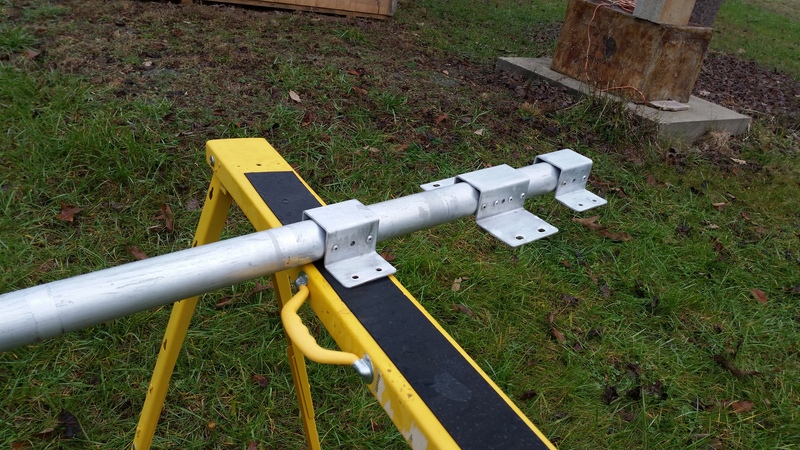 Their meticulous testing and documentation of results confirmed what I had experienced; that trapped tribanders are not necessarily the best way to achieve multi band coverage, in fact the last triband Yagi I owned was a Moseley CL-33, and I had trap problems with it. In addition it was no better and perhaps worse on 15M than the home-brewed 15M 3-ele beam it replaced. 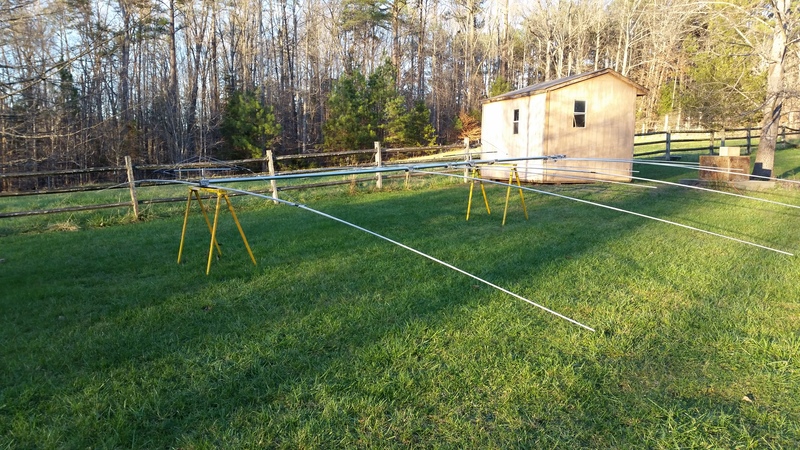 As a result of reading NØAX and K7LXC’s book coupled with my own experience I resolved to purchase a Force 12 C-4XL or C-4SXL 4-band multi monoband Yagi. After some looking around I was lucky enough to find a classified ad in QTH.com which read “Force 12 C-4SXL and Rohn HBX56 free if you take them down and take them away.” A phone call revealed the situation was a divorce where the non-ham spouse got the house and tower, and she just wanted to get rid of all the ham stuff. A couple of days later I was on the road with a willing friend (thanks David! We had fun in Louisville, eh? ), and after a somewhat arduous disassembly headed home with the antenna, tower, and a Yaesu G800SA rotator. The C-4SXL had obviously been in the air for quite a while, the fiberglass insulators had lost all of their gelcoat and were frayed and fuzzy, and all galvanized hardware was totally rusted. On the positive side, all parts were there and the rivets were tight, showing the viability of that attachment method. I originally thought I might switch from the original Force 12 U-bolt and PVC conduit insulator approach for element attachment, to a Stauff-type resin clamp with reinforcement plate like that sold by DX Engineering. A quick calculation showed it would cost $231 + shipping and new holes would have to be drilled in the boom attachment plates, perhaps leading to slop in positioning. 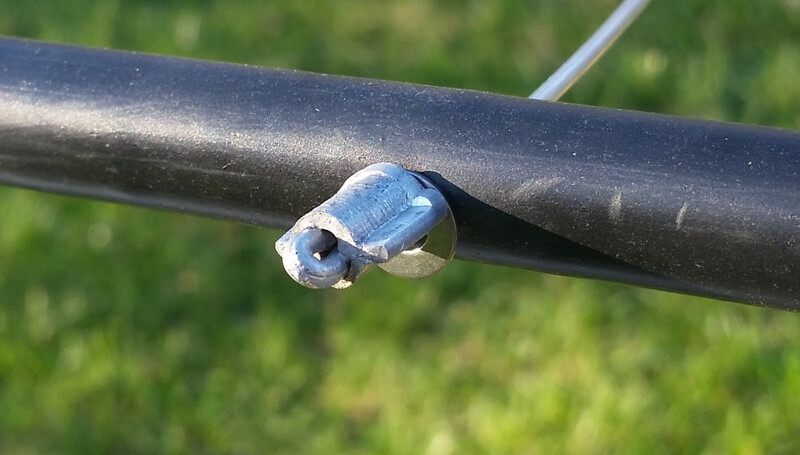 Pricing out a full set of new SS U-bolts and PVC conduit came to <$80 including new wide-flange SS Nylock nuts and extra-heavy SS lockwashers, and this convinced me to follow the original route, substituting SS U-bolts for the original galvanized. After some analysis I believe the original Force 12 method of element attachment simple as it is, would be stronger than the polymer blocks and bolts on the old-style element brackets due to how they clamp the PVC and element tubing directly against the boom brackets and close to the boom. This fully boxes the boom and makes the element and PVC tube into a structural part of the element to boom bracket. This translates the element’s rotation motion into pure shear on the boom rivets, a mode in which they are strongest, arresting bracket rotation and making the whole system tightly coupled and very rigid. It is a clever and minimalist system! The Stauff clamps suspend the element farther away from the boom, giving the inertial moment of the elements a lever-arm farther away from the center of rotation (the boom) which can induce additional torsion on the mounting plate. Because they are not clamped in intimate contact over a large area of the plate like the original method, they offer little reinforcement to the plate stability allowing the plate to bend. You will note when Force 12 changed to the polymer block method they redesigned the boom brackets thicker, with a bottom plate to take the place of the element’s contribution to rigidity and designed them to be riveted on all 360° of the boom instead of just 180° as the original was: http://www.force12inc.com/pages/parts.html . I’m sure it is much better in general and would upgrade to it if it was worth it, but I’m also sure they could not get away with the earlier version brackets with the new mounts. There is a lot of hardware on this antenna, and I used McMaster Carr to get most of it; numerous SS U-Bolts, flanged SS locknuts and oversized SS split lockwashers and other hardware parts. They are not the cheapest source, on the other hand, there was only the one shipping charge and they showed up the next day. You gotta love McMaster Carr! The previous owner (or one before them) had painted and taped the PVC pipe section insulators and they were in bad shape. I cut new ones from 3/4″ and 1″ grey schedule 40 electrical conduit and discovered why they were slit lengthwise: the ID is 0.085″ larger than the OD of the aluminum tubing they are supposed to clamp tightly. I ended up milling a 0.125″ slot down the length of each to allow the compression. On the subject of the 40M elements; the ‘studs’ as Force 12 calls them, clamp the loading wire to the element at midsection. As I got them, the SS 1/4-20 bolts were all seized in the aluminum studs and all attempts to heat and lubricate them failed, so the bolts were backed out by force. As they came out, so did a lot of the threads in the aluminum stud. A 1/4-20 Helicoil could not be installed, since the resulting hole was too large for a 1/4-20 Helicoil tap. As a result I just drilled and tapped them for 5/16-18 SS bolts, and added lock nuts and lock washers. You can be assured when I installed them all hardware received a liberal coating of the anti-seize, as well as Noalox between all aluminum parts! The original approach used by Force 12 when attaching the linear loading wire to the spreader was to push the wire through the hole in the fiberglass spreader and wrap it around the spreader rod, then secure it back to itself with two galvanized guy wire clamps. Given how brittle the high-tensile steel core is of Alumoweld wire, the sharp-radius bend at the hole seemed like a bad idea, and dissimilar metal corrosion with the clamps sets in very quickly, not to mention I thought this part of the loading system looked very sloppy and haphazardly designed. Of course it was probably the easiest and least expensive way to secure the wire without special tools. After thinking about how to clean up the linear loading system, I discovered perhaps the only one good thing about maintaining wire horse fencing: you end up owning tools for splicing wire. As a result I already had the solution I chose for the linear loading wire termination. Should someone else decide to do the same, the tools are not that expensive and useful for crimping large sleeves and terminals of many types. Here is a link to one such tool and gritted crimp sleeves: http://www.tractorsupply.com/tsc/search/fence%20wire%20crimping%20tool . This system is strong; I have had a 1200 lb. horse run into the fencing, and the wire did not break at the splices! The final step in assembling the C-4SXL was mounting the baluns. I kept the EB-1s as they have >1kohms impedance from 7MHz upwards, which is acceptable. The previous owner had merely taped them to the boom, which I did not like from a stability viewpoint, and tape looks like crap. 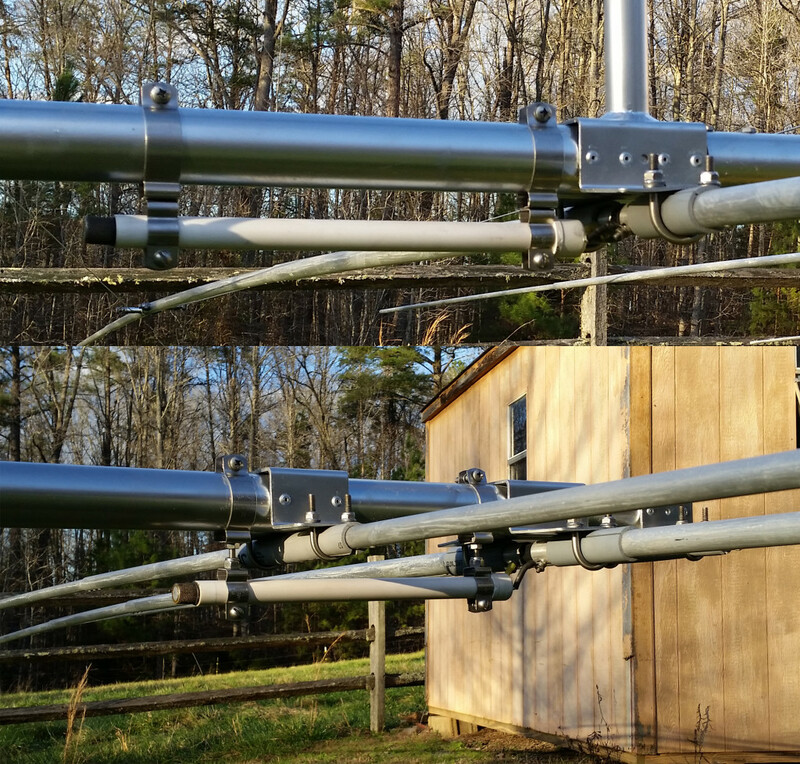 I located some SS conduit hangers and joined them, then mounted the 40M balun as shown in the upper picture below. 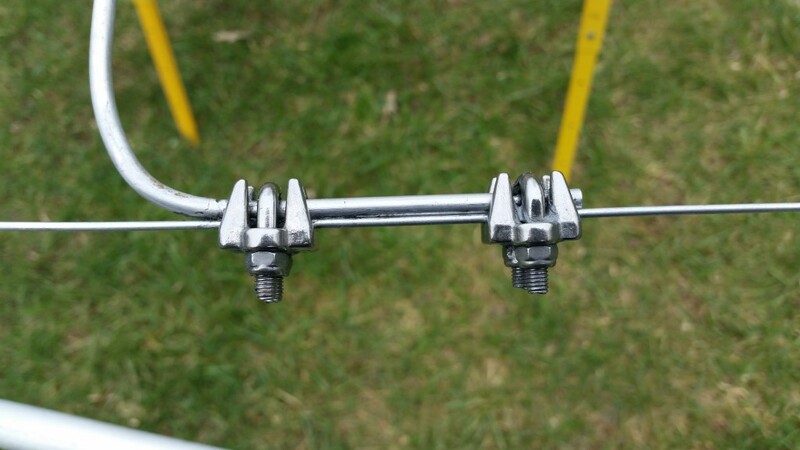 The 20M/15M/10M feedpoint balun requires the hangers to drop the balun by at least 3/4″ to clear the 15M driver as shown in the lower picture. My new-to-me C-4XL also needed a bunch of work and my work was almost identical to yours. The only thing of value I can add is that the Pop rivets I used (from McMaster-Carr) were “corrosion resistant blind rivets”. This I learned after inquiring the old Force 12 company and then the Tower Talk email reflector. I’ve had mine up since 2012 and found I mostly don’t need to run an amplifier. Like some cameras, it’s a “point and shoot” yagi. I’m not sensitive to nickels, but a fiver will get my attention! I’ve checked several times and never found a problem mixing 5nn and 10-32 hardware. Can be convenient on a weekend. You could just put a scrap of wire in that crimp to fill it, but the annealing is pretty. I bought a Chinese crimper, fractional sizes, and it seems as good as Nicopress. I make 3/16″ wire rope slings, with single sleeves, for tractor work and none have let go! Nice job! I’m anxious to hear it! The crimper I have was most likely bought at Tractor Supply, and there is little there not Chinese, so….yes, the crimps do not look as uniform or pretty as using an official Nicopress tool, but they are strong. Thank You! I have a C4-SXL sitting in the yard right now (and it is a mess). I have been trying to figure out how to approach a rebuild (I sure miss the 2-ele 40m). This detail helps a lot!! Thanks for the comment Bert! Good luck with your rebuild, it is an interesting challenge! It is a fun project, let me know if you need any info or supplies. I was’nt sure how to approach my rebuildt,but after i read what you did, i feel inspired to tackle the job. Thanks for the comment Rayne! Let me know if you have trouble finding any of the parts described in the article, I’ll be glad to help you. Good luck with your own rebuild. The job is not difficult for sure, just a lot of different details to pay attention to. Let me know if you have any questions or have difficulty getting any of the supplies. We regularly ship worldwide every day. Thanks for share your rebuild. Not sure about this point because no manuals. 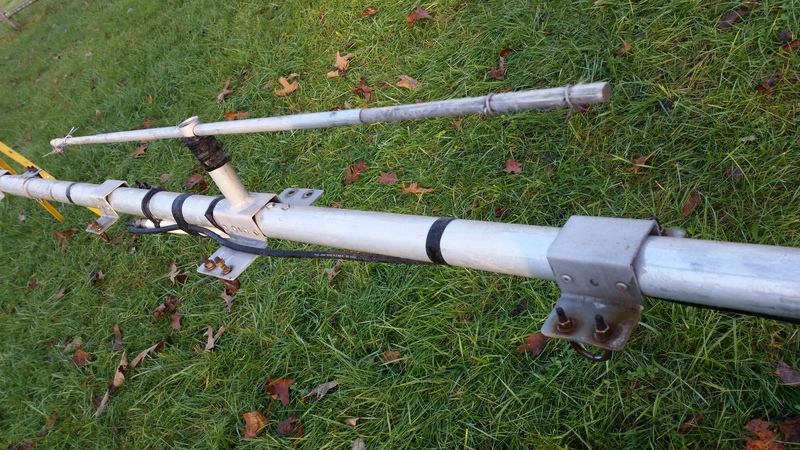 The 40M reflector has a very short jumper between the two element halves, the driven has a loading coil not shown in the pictures. How many turns and diameter of 40 meter coil? I read it somewhere but cannot find it now.. Putting up and restoring my C-4SXL after quite a few years of not being used. Sorry for the long delay in replying. My coil is 2.745″ ID and 3 turns, made of 0.25″ tubing. flattened and drilled to go over the terminals. Hope this helps! I was very fortunate to get the original Boom which is 9.5 meters long and the 2 elements for 40 meters from a fellow Ham that live in South africa. I also got a booklet from another Ham, which explain it step by step with pictures how to assemble the antenna. I had to assemble the antenna on top of my double-storey roof because I did’nt have enough space on the ground.I was battling to get the wire for the linear loading and then I decided to use a 6 mm solid aluminium rod, which was avilable at one of the local factories selling aluminium tubing.My Force 12 C4 XLD is up and I must just get the SWR right.If there is anybody who need the paperwork, you can give them my e-mail address and I am willing to forward them a copy.Thanks for your inspiration. Those ‘black insulators’ are the original fiberglass rods which had totally lost their gelcoat, so I melted dual-wall marine heat-shrink tubing over them. The marine grade heatshrink seems to be much longer lived, and is available on Amazon among other places. How long must the “coil” wire be that connect the 2 sections of the Boom. I tried moving the jumpers to get the SWR right ,but I was un-successfull. Of course the reflector halves have a very short wire connecting them together. I just raised my C4XL after performing a rebuild very much like what you describe. It came out very nice. She is back up at 70’. 40 tunes well, 20 tunes great at less than 1.2 SWR across the whole band. However; 15M & 10M are both just over 3 SWR across their bands. I’m wondering what your 20/15/10 SWR values are? Found the problem …. my 20M driven and reflector were installed backwards. Repositioned the elements and now all is perfect. None of my elements were disassembled during the rebuild. The 15 & 10 element mounts were cleaned and the element assembly was not modified in any way from the original assembly. I do have a 2M vertical plane 11 element beam about 6′ over the C4XL. Maybe that is causing a conflict. Thanks for the drawing showing the position of the coil. I did my Force 12 C4XL during my December 2017 holidays and I can report back that it is now working 100 %. I made 3 mistakes previously, that made me battle to get the antenna working. I mentioned it to fellow Ham and he said that I must lower those antennas and everything changed for the better. 2. The centre spreader where the linier loading wires were mounted on was only 600 mm wide instead of 1220 mm and that made it difficult to set the resonnent frequency. I am now getting 59 +10 & +20 reports from Hams like KE5EE,K6MYC , W7GI and many others from the USA. That’s great news and thanks for the tips! These antennas though an older design are still high-performance. Hi thanks for the write up! I also have a used Force 12 with 2el on 40. Mine was missing the linear loading wires. I have 14 gauge aluminum electric fence wire I was going to use for the linear loading. I was wonder what lengths do I need for the wires? Also planned on Using the same for the shorting sections but noticed yours is rigid like tubing or rod? Using regular wire is not recommended? Does the shape of these tuning stubs make difference and what are the total dimensions for the linear loading wires. It appears the reflector and the driven element are of the same dimensions, is that correct? I understand that this 40 meter linear loading is difficult to tune and requires being tuned at height. I hope to get it as close as possible and avoid many trips up and down at 54ft. I have no other antennas to detune the antenna. Of course mileage often varies. Where should I start with this linear loading wire dimensions? The lengths are set by the distance between the center fiberglass spreader and the studs on the element at the split point. Following the instructions will let you set them up correctly. The inverted “V” tuning jumpers have 4″ legs bent at a right angle to clamp to the linear loading wires, and between these legs they are 45″ in length, so before bending to shape they are 53″ overall length. Because the linear loading wires converge in a “V” shape at the element half split point, you merely make the “V” more or less spread open to allow the tuning jumpers to line up. Remember the reflector halves get jumpered, and although I have heard of people doing without a hairpin match at the driven element feedpoint, it is recommended. Great article! My crusty old C4 is lying in my driveway, with no place for my wife to park. The U-bolts are so rusty, it’s difficult to tell what sizes they originally were. It looks like I need 1.5″ ID, 2″ ID, and 2.5″ ID… do you still have the McMaster-Carr PNs or exact sizes? I wonder if you got the linear loading sorted out on your side. Like I said I used a 6 mm solid aluminium rod , which also helped to pull the elements in line with the other elements for 20,15 & 10 meters. On the end further from the boom it must stick out about 6 inches as stated in the manual and near the boom the ends must be 1200 mm apart. You can than move that V- sections that you bent further away fro the boom. For the driven element mine is about 300 mm from the boom and for the reflector it is 100 mm from the boom. The SWR on the other bands is perfect. the linear loading is just to get the SWR right for the 40 meters.